Martell Premier Voyage is an absolute top-of-the-line product launched by the company Cognac Martell commemorating its 300 years of existence. Martell Premier Voyage is an absolute top-of-the-line product launched by the company Cognac Martell commemorating its 300 years of existence. A mouth-blown bottle reveals a mix of 18 eaux-de-vie altogether. The exclusivity of cognac Martell Premier Voyage is highlighted by its feature of limited edition – a mere 300 bottles have been made for consumers all around the world. Our company Pernod Ricard Slovakia has managed to import three bottles of this extraordinary beverage to Slovakia. The oldest French producer of cognacs and one of the most renowned representatives of conceptual art have merged in an effort to create something unquestionably unique. A special limited edition of the bottle holding this fine beverage has been conceived by a brilliant artist Bernar Venet whose work is widely recognized not only in France, Belgium, Austria, Switzerland and Germany but also in the USA, Japan, and New Zealand. In 2005 he was honored with the highest French award, Chevalier de La Legion d’Honneur. 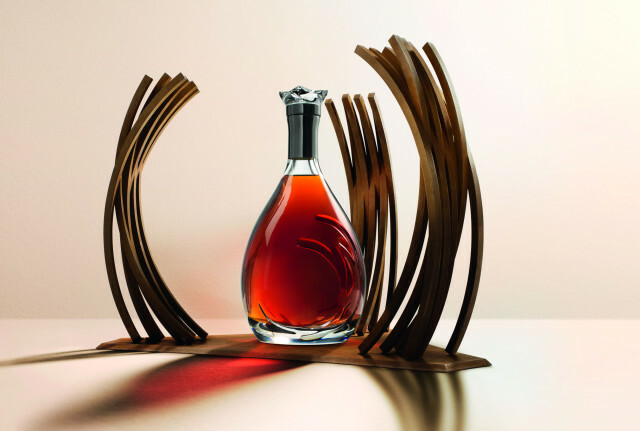 The eternal design of the mouth-blown bottle conceived by Venet for the Cognac house Martell standing for excellence right since its establishment By Jean Martell in 1715 carries 3 groupings of metal arches. They symbolize 3 centuries of its existence on the one hand and the hoops of the barrel on the other in which this finest drink is being aged. A crystal carafe with its unique contents is embedded unraveling in the elegant shape of a tear inside the barrel. Right off the bat Martell Premier Voyage seduces you with the bouquet of caramelized orange peel, blackberries, honey and ginger-bread to usher you further into the sophisticated unveiling of walnuts in a delicate combination of apricots and sultanas circled around a long spicy conclusion with the final touch of beeswax. The exclusive Martell Premier Voyage is a masterpiece hands down. A mix of meticulously and painstakingly blended 18 eaux-de-vie (standing for the „waters of life“ – the result of fermentation and double distillation of grapes) of which the youngest comes from the vintage of 1977 and the oldest is an incredible 147 years old. No wonder this fine cognac has been part of royal families in its 300-year-old existence – its exquisite taste was enjoyed by George IV., King Loius Philippe, Napoleon III., Alexander III., Franz Joseph of Austria, George IV, Elizabeth II., Rainier III. just to mention a few. A prominent contradiction between the ever flowing shape of the bottle and the potent energy hidden inside the arches points out the perfect harmony between tradition and a latest visionary spirit, in other words something that is so characteristic of the cognac house Martell. The number of bottles holding this outstanding drink is symbolic as well; exclusive 300 pieces in commemoration of the anniversary. Just 3 bottles of this outstanding beverage will be available on premiumspirits.sk.